Who wouldn't want a pair of Cinderella-like sandals from Manolo for $230? Or ostrich platform pump from Bally for $310? 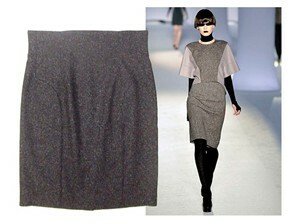 Maybe someone who is more into high-waisted pencil skirts than shoes... YSL runway look for $195! I'm almost in New York (my mind is there for sure even though I'm in the middle of the annoying mid-term exams) and so I did a bit of research on vintage shops and this is what I found. If you happen to know about some other amazing vintage/second hand places please share with me :). Vitezslav: jojo, to znam...tam koukam a koukam...jeste jsem nic neporidila, ale jednou to prijde!